IPL 2019: Big game for MI and Nita Ambani. 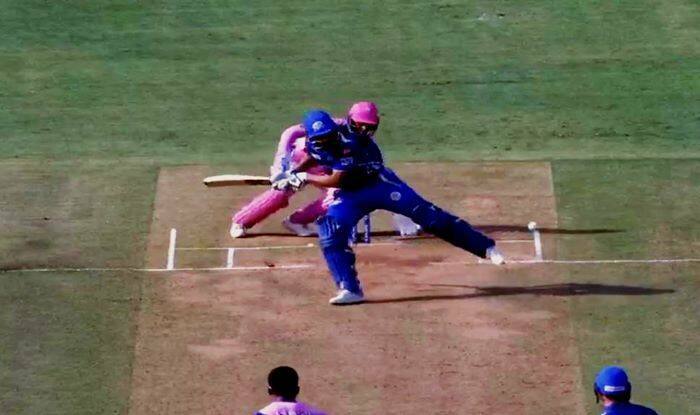 IPL 2019: Was it the most bizarre shot ever? MI captain Rohit Sharma did the unthinkable during MI v RR at the Wankhede Stadium. It happened in the 10th over when Rohit premeditatively came down the track as Gowtham smartly darted it down the leg-side. Rohit spotted that and in order to not get stumped, he kicked it away into the leg-side with his front leg. Would have been a wide had he let that go and even Samson could have found it tough to grab. As he deliberately padded it away, the batters can’t take the single. Meanwhile, Rohit has been dismissed for 47 off 32 balls. He got the team off to a good start with Quinton De Kock after the Royals won the toss and opted to field. Rohit and De Kock stitched a partnership of 96 runs for the opening wicket. When mom wants you to be a cricketer. Dad wants you to be a footballer.